IBM® Decision Optimization on Cloud delivers an easy-to-use, self-service decision environment for your organization. The solution helps all users harness the power of optimization-based decision support without the install, deployment and maintenance requirements of traditional, on-premise infrastructures. 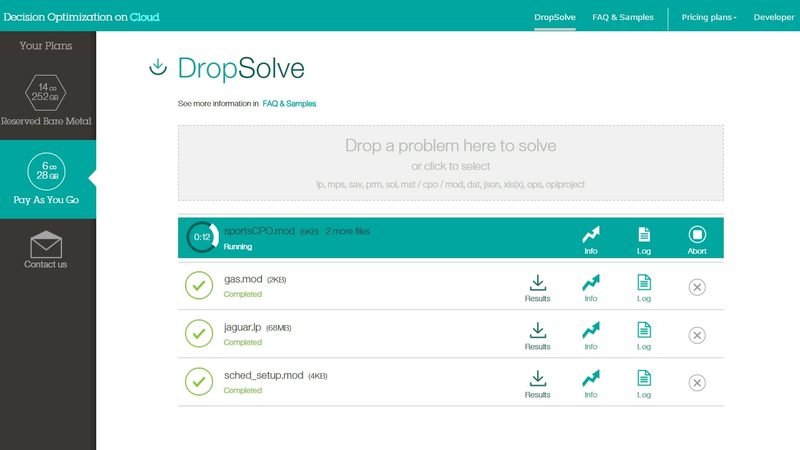 Benefit from a decision environment that helps you define alternative, what-if scenarios using the DropSolve drag-and-drop interface. Use algorithms to solve mathematical optimization problems. Quickly find optimal solutions for your planning and scheduling, supply chain and asset management challenges. Work with an open, standards-based architecture. Help minimize the risk associated with custom application development. Embed CPLEX optimizers in applications using the IBM DOcplexcloud API. Use cloud-based virtual machines. Benefit from flexible configurations, without the need for complex installations or hardware, allowing you to use only what you need.